The current turmoil in Kashmir over the killing of Hizbul Mujahideen commander Burhan Muzaffar Wani and the subsequent death of more than 30 protesters in violent clashes with police and security forces will have crucial implications for the way in which many Kashmiri people have come to see themselves and the Indian state. Voices calling for peace and dialogue must prevail over those insisting on confrontation and conflict. Terrorist Burhan Wani, the so-called poster boy of Hizbul, had become a cult figure in the new insurgency in Kashmir. His psychological warfare tactics were aimed at delivering threats to the security forces and attracting more youth into insurgency, partly because 60 percent of the valley’s population is below the age of 30. The new wave of insurgents, primarily from Pulwama, Anantnag, Kulgam, and Shopian, are mostly educated and come from reasonably good socioeconomic status. The impression one gets from a recent visit to Kashmir Valley is that an interpretation of Islam – variously described as “ultraconservative,” “fundamentalist,” or “puritanical” – has been steadily gaining ground in many parts of Kashmir, and the jihadist passion is one of major factors for joining the insurgency for new recruits. The attempt to change the worldview and vocabulary of Kashmiris to suit the Wahhabi-Salafi mentality is not only disturbing but also precludes the prospects for peace. On the ideological battlefield, efforts need be made to delegitimize Wahhabi-Salafi jihadism. What about the real battlefield? There are two broad approaches to dealing with an insurgency. One is the conventional military approach, also called anti-insurgency or enemy-centric approach, which focuses on targeting the insurgents. These strategies have sometimes been labeled as counterterrorism. The other is a population-centric counterinsurgency (COIN) approach, which is aimed at cutting off the insurgents’ supply lines by either providing incentives to the population for supporting the counterinsurgent forces, or by imposing costs on the population for supporting the insurgents. The general bias of the population-centric COIN perspectives is to give prominence to winning the hearts and minds of the population, which essentially means convincing the people that the advantages of supporting the government against the insurgents outweigh the advantages of supporting the insurgents. The ultimate goal of both the approaches is to restore stability and the population’s support for the government forces; the means are, however, different. An adverse side effect of the almost endless, and not significantly effective, “iron fist” anti-insurgency operations is the need to maintain a large military presence just to create an illusory sense of safety and stability. Although the risks of implementing and using anti-insurgency tools are too many to be ignored, the often-overlooked danger of a population-centric approach is that it causes the soft target population to suffer retribution when insurgents begin to view the people to be conspiring with the counterinsurgency forces. The nightmarish scenario for population-centric approach is when the insurgents are made up of the local population while counterinsurgency forces are predominantly from outside the conflict zone. In such cases, the government forces are seen as occupiers and are rarely able to gain the trust of the civilian population. As misplaced religious beliefs shape insurgents’ causes and are used to obtain support among the community of the faithful, countering insurgency becomes even more burdensome. Those favoring the population-centric perspective often view themselves as having a more sophisticated understanding of insurgency. In a real sense, this debate is purely theoretical, and most strategic thinking is not completely at either extreme of these two poles. Following the Soviet invasion of Afghanistan, the CIA’s policy of supporting the so-called jihad led by Pakistan-trained Afghan mujahideen ultimately resulted in upsurge of terrorism in Kashmir, which was actively supported by Pakistan. But India’s military and paramilitary forces, with their impressive counterterrorist resources, relentlessly uprooted the Pakistan based terrorists as well as home-grown insurgents by the late 1990s. And it can be reasonably claimed that by 1999 not much enthusiasm was left among the Kashmiris for freedom or azadi. The sudden lull in Kashmir was broken only in 1999 by Pakistani intrusion into Kargil. Although Pakistani support for anti-India terrorist activities continues unabated, as reflected in the ISI-orchestrated attempts to infiltrate the country, Indian security forces have been successfully thwarting them. Infiltrations have been reduced to a trickle. The number of casualties, both civilian and security forces, has also seen a decline. The present chaos in Kashmir encapsulates the differing priorities that define New Delhi’s troubled relationship with Kashmir. 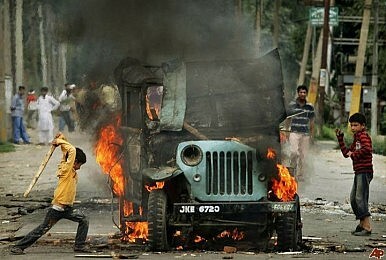 The fresh violence in Kashmir has jolted the central government, which was gradually receding into complacency. In the absence of an overarching strategy under the People’s Democratic Party (PDP)- Bharatiya Janata Party (BJP) coalition government in Jammu and Kashmir, there seems to be confusion at the highest echelon as to which policy tools should be accorded primacy. The result has been a stalemate in counterinsurgency strategy, unable to fully succeed in reaching the desired objectives. In the wake of the revival of insurgency and a spike in terrorist incidents in the valley, the Modi government is reported to be planning to replace Central Reserve Police Force (CRPF) with the Border Security Force (BSF) in some areas of restive Kashmir. The BSF was used to implement counterinsurgency in Srinagar in the 1990s. Constituted and suited for guarding the borders, the BSF gradually adapted to the situation and played an active role in decimating the insurgency. In 2005, the BSF was replaced by the CRPF. Whether the BSF is re-inducted or not for counterinsurgency operations in Kashmir is for the government to decide, but it undeniable is that counterinsurgency operations are always a dirty business. Indian military and paramilitary forces in Kashmir often find themselves in an alien environment, invariably surrounded by an unfriendly population. On the other hand, the police are the primary arm of the government focused on internal security. Unlike the military or the paramilitary, police usually have a permanent presence in cities, towns, and villages. They have a better understanding of the threat environment in these areas, and better intelligence. An effective police force can be critical to establishing law and order in areas affected by insurgency. The military may be able to penetrate and garrison an insurgent area and may reduce guerrilla activity. But once the situation in an area becomes indefensible for insurgents, they merely shift their activities to another area, and the problem remains unresolved. Local police forces often have a sound knowledge of the terrain and the population within which they move around, live, and fight. Taking into consideration local cultural peculiarities allows greater adaptation and integration. The competence of police and the quality of governance have historically affected the success—or failure—of counterinsurgency efforts. The likelihood of success appears to increase with better policing, as well as more credible governance that can efficiently deliver services to their populations. But the Kashmir conflict is not a security issue alone. It is a political problem that needs a political solution. The only mantra for conflict resolution is to talk, and talk to everybody without condition. The prolongation of the armed conflict in Kashmir has resulted in unspeakable sufferings for the Kashmiris as well as the security personnel posted in that extremely volatile region. Besides diverting scarce resources from much-needed development projects to an extraordinary arms build-up in the region, an entire generation has grown up in Kashmir for whom killings are a routine affair. The Kashmiri people’s sense of alienation from India remains as strong as ever. But despite widespread anti-India feeling, the general Kashmiri perception is that joining Pakistan is not the best option for Kashmir. Thus, Modi government’s strategic vision for Kashmir should place less emphasis on hard tools, tipping the balance toward a political resolution of the seemingly intractable conflict. We need to bring politics back into Kashmir. Vinay Kaura is an assistant professor in the department of International Affairs and Security Studies, and Coordinator at the Center for Peace and Conflict Studies, Jaipur, Sardar Patel University of Police, Security and Criminal Justice, Rajasthan, India.